PE-12 EXTREMELY URGENT! Introducing 'Cammy'! 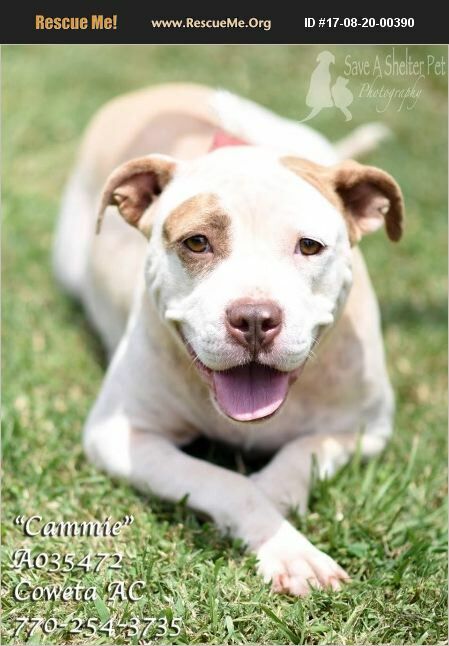 'Cammy' has an incredibly sweet, loving and humble personality. All you have to do is take a look at her video and you can see that she is very submissive and loves nothing more than to be by your side receiving love and affection. This precious soul came into the shelter as a stray from Griffin Dr. in Newnan / Coweta County. It was obvious that she had had pups (and probably many litters) but her pups were not with her. This precious lady is also heartworm positive and would need to be treated. With each passing day, her time is getting shorter. Will you open your heart and home and offer her a second chance at life and love? PLEASE HURRY! This pet has been at the shelter since 07/21/17!! As a special thank you for adopting from Coweta County Animal Control, Sliding Rock Cabins in Ellijay, GA would like to extend to you and your new family member a discount of 10% off any reservation of 6 nights or less. Or 5% and the discounted weekly rate for 7 or more nights. www.slidingrockcabins.com 866-666-2224. Just mention Coweta County Animal control and which fur-baby you have adopted when making your reservation. All cabins are pet friendly, many with fenced yards. No size or breed restrictions at most cabins. In appreciation to Coweta's foster families - this offer is extended to fosters also. Thank you Sliding Rock Cabins! !